An exceptional opportunity is being missed. A chance to alleviate suffering and to achieve health care cost reductions for society is available, but is being ignored. There is an explosion of new knowledge about the emotional and intellectual development of children, and the causes and treatment of psychiatric disorders of children and adolescents. Research from diverse disciplines such as the developmental neurosciences, psychoanalysis, psychopharmacology, developmental psychology, and genetics propels us forward,. However, the effects of this new knowledge reach children and adolscents slowly, or not at all. The long history of neglect of the mental health of children and adolescents is now exaggurated by sudden, disruptive economic and political influences on mental health services for children and adolescents in most countries. Prevention and treatment of emotional and intellectual problems in childhood and adolescence have vastly improved, but utilization of these advantages lags behind. This disappointing incongruity stimulates a need to document our knowledge about these services and systems and to make it more broadly available. This is the primary aim of this new volume by a team of distinguished contributors. It reviews the causes and prevalences of psychiatric disorders in children and adolescents, the problem of health care financing for these services, the underutilization of these services, our current understanding of the outcomes of treatment, and the new models for both treatment and prevention. The book also provides a survey of current mental health services and sytems for children and adolescents in countries across the world. 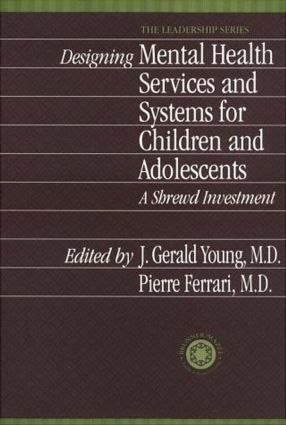 Information drawn from these multiple perspectives is has been used by a group of international experts to develop the Venice Declaration, providing specific guidelines for families, clinicians, administrators, and policy-makers who are concerned with the development of children and adolescents, and are committed to a more efficient economic approach to mental health services. Part I. The Genesis and Prevalence of Developmental Psychopathology: Defining the Need for Mental Health Services for Children and Adolescents. Developmental Psychopathology and Child Mental Health Services: Risk and Protective Factors in Children, Families, and Society. The Scope and Prevalence of Psychiatric Disorders in Childhood and Adolescence Part II. The Costs of Developmental Psychopathology: Financing, Management, and Quality of Care of Mental Health Services for Children and Adolescents. Trends in Cost Management for Healthcare Delivery Services: Managed Care in the 1990s. The Consequences of Changes in Mental Health Systems for Individual Children and Families. Quality and Economics: The Concept of Equity in Times of Limited Resources. A Shrewd Investment: The Economics of Mental Heathcare for Children and Adolescents Part III. The Utilization and Outcomes of Current Treatments for Developmental Psychopathology. Survey of the Utilization of Psychiatric Services for Children and Adolescents in Germany. Issues in the Evaluation of Systems of Mental Health Services: A Perspective and Recent Developments. Evaluating Community-Based Mental Health Services for Children with Serious Mental Illness: Toward a New Paradigm of Systems of Care Part IV. Models of Treatment and Preventive Interventions for Developmental Psychopathology. The Mental Health System for Children and Adolescents: Issues in the Definition and Evaluation of Treatments and Services. Research Priorities for the Improvement of Mental Health Services for Children and Adolescents: A Social Work Perspective.Treatment Outcomes: Psychoanalytic Psychotherapy. Prevention Research in Child and Adolescent Psychiatry. A Framework for Preventive Intervention: Parental Awareness of Developmental Problems and Early Diagnosis in Child and Adolescent Psychopathology. The Mental Health Team in the Daycare Center: The Role of the Child and Adolescent Psychiatrist. Can Home Treatment Replace Inpatient Treatment of Child and Adolescent Psychiatric Disorders? Mental Health Services for Infants and Young Children . Designing Mental Health Services for Adolescents. Designing Mental Healthcare Systems: Implications for the Training of Future Clinicians. International Models of Mental Health Systems for Children and Adolescents: What is the Reality When We Put Principles into Practice? The Organization of Clinical Care, Training, and Research. Child and Adolescent Psychiatry in France. Approaches to the Development of Mental Health Systems for Children in the Nordic Countries. Management Strategies for Mental Health Systems for Children and Adolescents. The Structure and Organization of Services for Children and Adolescents with Psychiatric Disorders in Germany. Mental Health Services for Children and Adolescents in the United Kingdom International Perspectives on the Economics of Mental Health care for Children and Adolescents: Economic Policies and-- the Swedish Experience Mental Health Reform: The Israeli. Managed Care: -- How Is It Managing in the United States. Developing New Mental Health Systems for Children and Adolescents. Challenges in Providing Mental Health Services for Children and Adolescents in India. The Economics of Mental Healthcare in the Context of Rapid Political Change in Hungary. The Current Status of Mental Healthcare for Children in Russia. Planning Mental Health Services for Children and Adolescents in Brazil. The Impact of Changes in Healthcare Systems on Psychiatric Care for Children and Adolescents in Hong Kong. Transitions for Mental Health Services for Children and Adolescents: The Polish Experience. Strategies for Responding to the Needs of Adolescents in Romania. Summary: Reconciling Evolving Economic Strategies and the Needs of Children in 21st Century Systems of Care. Designing Mental Health Services and Systems for Children and Adolescents: Observations and Recommendations. Recommendations of the International Association for Child and Adolescent Psychiatry and Allied Professions (IACAPAP). Mental Health Services and Systems for Children and Adolescents.Declaration of Venice: Principles for Organizing Mental Health Systems for Children and Adolescents.